Small Cabin Forum / Cabin Construction / Minimum Depth of Rim/Header Board and Floor Joists? Construction has started on an 18' x 24' stick-built cabin with an 8' sidewall and a maximum roof peak height of 16' (probably shorter upon completion). The foundation is 6" x 6" wood pier, and the piers are spaced 8' apart on the 24' side and the widest span on the 18' side is 14' (there's a support beam there). The piers will be notched out to accept the rim/header board as they will be weight-bearing (walls). Given all of this, what does the minimum depth of the rim/header board need to be to be structurally safe? (2" x) 6", 8", 10", or 12"??? The lumber being used is SPIB No. 2. "Minimum" is important because I'm trying to limit the height of the floor above the ground. Will the floor joists also need to be the same depth, or can they be narrower since they aren't bearing as much load as the rim/header board? 1) What's the snow load you can expect? 2) How is the roof going to be supported - ridge beam, trusses, something else? 3) What's the span on those floor joists? From your description it sounds like 14' on one side and 10' on the other. Also, it sounds like you are talking about floor beams not headers. Headers are used over windows and doors to carry the loads around those openings. Rim joists are the same size as the floor joists. 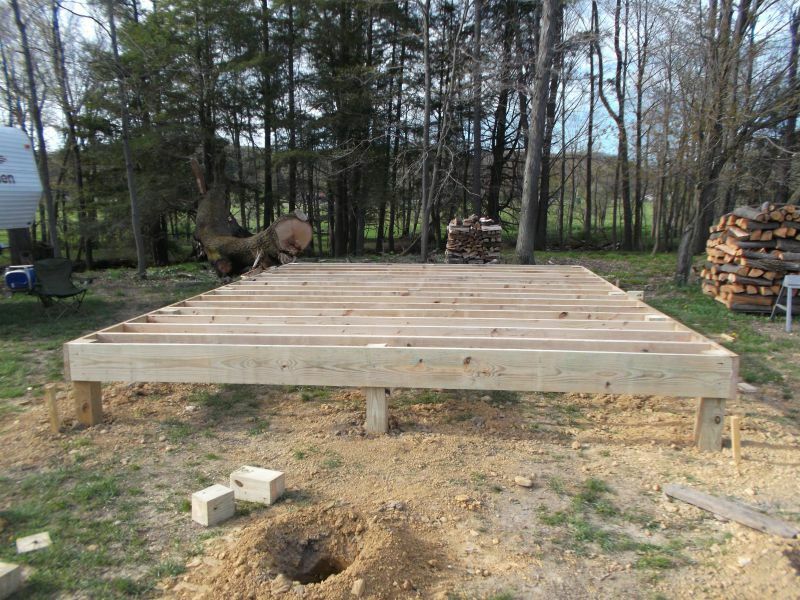 For example, if the floor joists are 2x10 then the rim is also a 2x10. Floor joists are sized according to the joist span. Being 18 feet wide it would appear you will have a center beam as well as the two long side beams. The 8 foot spacing on the piers seems a bit wide. But that depends on variables such as ground load bearing capacity, snow load, building width, beam size, how the roof weight is supported, etc. As NorthRick said, "Need more info." Since you are using 6x6 piers a triple layer laminated beam with plywood spacers to make the widths match would work. Probably a 3-2x10 beam will work with 8 foot center to center pier spacing. Rim joists do not support the wall above. The wall is supported by the ends of the floor joists and the subflooring that is installed on the joists. Rim joists provide lateral placement for the joist ends as well as enclosing the ends of the bays between the floor joists. Rim joists will also frequently have the exterior sheathing overlaid and nailed into place, making a wall that is more rigid than if the sheathing stops at the lower wall plate. It is also permitted to substitute full depth solid blocking between the joist ends though that is hardly ever done as it more labor intensive. Rims are usually fastened to the joist ends with 3 x 16D nails (or 4 x 10D). Driven into the end grain of the joists that connection cannot support much vertical load. When building on piers the best method is to run a load bearing beam that is seated on top of the piers. Nowadays beams are usually laminated 2x dimension lumber with all the splices located directly over a support pier. The nails just hold the lumber together during construction and contribute nothing the load carrying strength. Floor joists then either sit on top of those beams and have rim joists fastened to the joist ends, or the joists are secured between the beams using joist hangers. That has the advantage of lowering the floor deck by the depth of the joists and doing away with the need for a rim joist. Disadvantages include the need for the greatest precision in locating the piers as well as being more time-consuming and having the extra cost of allthe hangers. . ..
Also when trying to get the floor as close to the ground as possible that the lower edge of a beam should be no closer to the ground surface than 12 inches, or PT wood will be required. Floor joists should be PT if the lower edge of a joist is less than 18" from the ground. A drawing showing the details would always be a help when offering advice or a critique on proposed methods. Snow load will be low. It's in south-central IN, maybe 30 mins from the Ohio River. I'm not an engineer or architect, but I will say no ridge beam or trusses, but rafters with a partial loft and collar ties to keep the roof from spreading out. The span of the floor joists from end to end runs front to back, so 18'. Now, there is a support beam there at 14' from the back, which is where an interior wall will be. So, it's 14' from the back to the support beam, and then 4' from the support beam to the front (for a porch). A point to make is this - the posts are already in the ground, so those can't be changed. It's something I have to work with/around. The rim joist/header has to carry some load as the walls will partially be on top of them (with the rest of the walls on the very ends of the floor joists and posts). That's why they need to be notched out - to transfer the weight to the posts and avoid a shearing force (as if they were attached to the sides of the posts instead). Given the load there, I'm wondering what the depth of the 2" x rim/header board should be to be structurally sufficient but also avoid raising the floor too high. Maybe I'm dense, but a dimensioned drawing would be of immense help in understanding--- you stated 18 x 24 but then have 14 ft plus a 4 foot porch. It is difficult to accurately visualize what you mean; difficult to visualize which way the roof ridge runs, which way the joists run, where the piers are, etc. Like I said, maybe it's me, but I can't offer advice when I am guessing. When given a size like 18 x 24 the floor joists usually run in the 18 foot direction and the roof ridge in the 24 foot direction. ICC, you have "guessed" correctly. Piers are spaced 8' apart on the 24' side and the space between piers on the 18' side is 14' from the back to a support beam (on piers), where an interior wall will be, and then 4' from there to piers at the front, which will be a porch. The floor joists will actually run the entire 18 feet, from front to back. OK. For sake of an example let's just suppose the floor joists are 2x10 and the rim joists are also 2x10. You want to notch the tops of the piers and nail or bolt those 2x10 rim joists to the pier tops... a total of three 2x10 down the one row of 4 - 6x6 piers. Those 2x10 rims would then do double duty; as a rim or band joist for the floor joists and to support the wall and the roof weight. Is that what you have planned? And you want to know what sizes to use for the floor joists and for those rim joists? Well, the problem is that forums and the internet are full of stuff like that. Stuff that is wrong. It was posted six years ago, was critiqued back then and I think that person was going to dismantle and make some changes. The image lives on forever even though what it depicts is wrong. The picture is from this topic. Have a read through it. Your 8 foot spacing of the piers is too great for using a single layer 2x like that. His were stated to be 5' apart. If I were to add 6" x 6" posts to the rows to make them 4' apart, what then do you suggest the rim and joist board depths to be? A single 2x8 can span 3'6"
The simplest solution to me would be to construct beams as layers of 2x material on top of the level tops of the existing posts. A triple layer beam of three 2x10 can span 7'7". Span is measured between the edges/sides of the supports, so the 7'7" should be fine if the piers are on 8 foot centers which would be normal. Then with beams running down the 24 ft length the floor joists would be hung between beams, using Simpson hangers. That would also keep the total height lower. Since most species of lumber used for floor joists can span 14 feet, 2x10 joists (on 16" centers) would be a perfect fit for laminated 2x10 three layer beams. However, another thing is still not clear to me. There would be a set of 4 piers across the back wall of the cabin with a beam on top, and floor joists anchored or hung to that beam side. You mention a second row of piers and a third row of piers, separated by 4 feet, for a porch. How is the roof configured? Is it a standard gable roof with the ridge running parallel to the 24 foot rear wall, the ridge centered over the 18 ft total width? Or is the roof planned to be a gable type centered over the 14 foot (inside) space and the porch to use a shed roof extra, as many folks do? One thing to consider if thinking of using a single 2x that is let into the pier is the spacing of the floor joists and how/where they will be secured to the rim. The piers can get in the way of exact positioning of the floor joists when the 2x is let into the outside edges of the piers. You don't want to mess with funky spacing of the joists as that will make nailing and alignment of full sheet subflooring a bigger task. Using a beam on top of the piers leaves the space between beams free for exact joist placement. If you increase the number of piers you probably increase the number of chances where piers may interfer with joist placement. How far can a single 2" x 10" span? Oh, and to answer your roof question - yes, "(it is) a standard gable roof with the ridge running parallel to the 24 foot rear wall, the ridge centered over the 18 ft total width". 4'6" free space between supports. I assume that the floor joists are to overlap the middle beam that is planned to go under the wall between the interior and the porch? 14 ft under the main cabin and 4 ft for the porch? If the plan has been to run the porch floor joists from the outside row of piers and overlap a pier set and beam or rim-type joist under the wall, there is a potential problem. The potential problem being that when the porch floor gets wet, water can wick back under the wall. If or when water gets under there it can cause rot in either the ends of the floor joists that extend back to the rear of the cabin or even in the beam under the wall. I was once asked to estimate a rotted porch floor repair. Inspection showed rot in several main floor joists at the beam. They never did repair it and sold it "as is" instead. Better porches are built with all PT wood for the floor and floor framing and are either supported at the house side by (1) a properly tied in and weather flashed ledger on the exterior of the main structure, or (2) on an independent set of piers that run alongside the house wall but is not attached to the house.